The Chiefs had surprised everyone in the league after a two game sweep in Everett to start their Western Conference semi-final series with the defending conference and reigning U.S. Division champion Silvertips. SPOKANE, Wash. — The Chiefs had surprised everyone in the league after a two game sweep in Everett to start their Western Conference semi-final series with the defending conference and reigning U.S. Division champion Silvertips. Now the big question ahead for Spokane was whether they could continue their success as they headed home to host Everett over the next 3 games at the Spokane Arena. The Chiefs knew they had to just win 2 out of a possible 3 games at home to move on to the next round, while Everett knew they had to win 2 of 3 to continue the series back in Everett next week. The Chiefs had averaged just 20 shots a game in the two games in Everett, but had scored 9 goals in the two contests as the club had taken advantage of their limited opportunities. Spokane's league leading power play was indicative of that capitalizing offense, going 2 for 3 in Everett. Game three was going to see a desperate Everett club trying to avoid falling into an 0-3 deficit, while the Chiefs were hoping to put the Silvertips one loss from elimination. Everett got a boost as well, as center Riley Sutter returned to action for the first time since late December. Spokane got the only power play of the first period, and once again the Chiefs would convert as Ethan McIndoe would tip in a Filip Kral shot from the left point just under 8 minutes into the game to give Spokane a 1-0 lead. That lead would be short lived however, as the Silvertips Robbie Holmes scored 1:57 later to even the game at one after the first. Everett controlled much of the first, out shooting the Chiefs 12-8 in the period. In the second, Everett would out chance Spokane 13-6 and would get two power play opportunities, but goalie Bailey Brkin was a wall and the two teams remained tied at 1 after the second. The third period would see the Chiefs come out with more pep in their step as Luc Smith knocked a puck free net front and Adam Beckman flew in and buried his 4th goal of the post season just over 2 minutes into the frame to give Spokane a 2-1 lead. Much like Sunday's game two, the Chiefs would protect that one goal lead through the third. Brkin would barely be tested as the Silvertips managed just 5 shots on goal in the period. 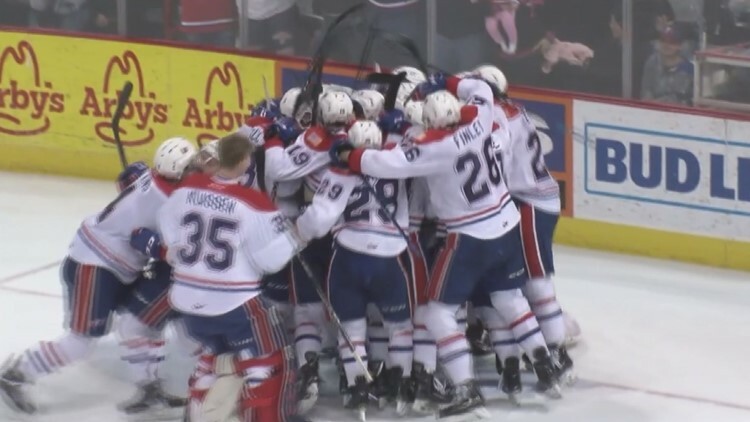 For the third straight game, Spokane would find the empty net as Jaret Anderson-Dolan scored with a little over 30 seconds remaining to hand the Chiefs their second straight 3-1 victory and a 3-0 series lead. For the third straight game, Spokane was out shot, this time 30-20, but the Chiefs won the special teams battle, going 1-3 on the power play and 2-2 on the penalty kill. The Chiefs were now squarely in the driver's seat in the series, but the saying goes that the 4th win is always the toughest and Spokane was fully expecting the Silvertips to be just as desperate in Friday's game 4. The Chiefs entered Friday's game knowing Vancouver had eliminated Victoria the night before to advance to the West finals, so Spokane was hoping to wrap up their series as well to match the rest the Giants would get heading into the next round. For the second straight game though, Robbie Holmes got the scoring started for the Silvertips as he scored 6:21 into the contest to give Everett a 1-0 lead. The Silvertips then converted a power play midway through the first to take their first multi-goal lead of the series at 2-0. Adam Beckman scored on Spokane's second power play of the period with just 1:07 left in the first to cut the deficit to 2-1 after the first 20 minutes. Everett would score the only goal of the second after a costly Chiefs turnover behind their net early in the period to head into the third with a 3-1 advantage. Spokane appeared to cut the lead to 3-2 late in the third on a Riley Woods goal with the Chiefs net empty with a little over three minutes remaining, but the goal was waved off after a lengthy discussion by the referees that ruled the Chiefs Luc Smith had interfered with Everett goalie Dustin Wolf. After watching the replay and reading the rule book, the call was missed as Smith was out of the crease by the shot and Wolf was set to play the shot before it arrived. The call took the wind right out of Spokane's sails, as well as infuriated the Chiefs crowd, and things got downright ugly when the Silvertips scored an empty netter to wrap up a 4-1 victory and narrow the Spokane margin to 3-1 in the series. To make things even worse for the Chiefs, defenseman Filip Kral was suspended for game 5 the next night after drawing a game misconduct for squirting some water on the ice in the waning seconds of game 4. Spokane now had to play game 5 without Kral as Matt Leduc had to step up to top 4 minutes on the blue line. Game 5 didn't start well for the Chiefs either, as Holmes scored the first goal for Everett for the third straight game with his 4th of the playoffs just 1:32 into the game to give the Silvertips a 1-0 lead. Leduc though would step up with a thunderous hit on Everett captain Connor Dewar midway through the first to get the crowd fired up. Everett also took an instigator penalty for fighting after the hit, putting Spokane on the power play. The Chiefs took advantage as Nolan Reid scored his first of the playoffs midway through the first to even the game at one through the first period. Spokane's power play would strike again early in the second as Riley Woods scored his team leading 6th of the playoffs on a one timer from Ty Smith at 5:24 to give Spokane a 2-1 lead. Little did we know, that would prove to be the game winner. Everett out shot the Chiefs 29-9 over the final two periods, and had a power play over the final 3.5 minutes of the third, but the Silvertips were unable to score on goalie Bailey Brkin as the Chiefs wrapped up the series with a 2-1 victory. No doubt that Brkin was the MVP of the series as he stood on his head at times when the Silvertips pulled Wolf from net and had a 6 on 4 advantage in the final 2 minutes. The Chiefs power play dominated in the series, not only scoring both goals in the clinching victory, but going 12 for 25 in the playoffs. Even more importantly, Spokane's penalty kill was 24 for 28 through 2 rounds at 85%, far above their percentage during the regular season. No one expected Spokane to knock off the defending Western Conference champs, let alone in 5 games. Every team wants to be playing their best hockey of the season going into the playoffs, and the Chiefs are showing why as they have knocked off two of the top 9 clubs in the league in the post-season. Now Spokane gets ready for their first West Finals since 2010-11, as they take on the top team in the West during the regular season, and #2 team in the league in the Vancouver Giants. Vancouver comes off a 4 game sweep over a depleted Victoria team that got outstanding goaltending to keep the series close on the scoreboard. Spokane will need more magic from Brkin and their continued outstanding defensive play to pull off another series upset. The Chiefs lost 3 of 4 to Vancouver during the regular season, but beat the Giants 4-1 in the two teams last meeting in Spokane March 8th. Spokane will hope to keep their road warrior mentality going, as they head to Vancouver for the first two games of the series Friday, April 19th and Saturday, April 20th. The series will come back to the Spokane Arena on Tuesday and Wednesday the 23rd and 24th. Friday's game will be a 7:35 pm start, while Saturday's will get underway at 7:05 pm. I'll have the call on 103.5 FM the Game and 1510 AM KGA starting with the pre-game shows at 7 pm Friday and 6:30 pm Saturday. It should be another great series and we hope to see you at the rink!